I noted recently the resurgence of Ireland's working class. The interesting question is why this hasn't translated into a surge for Labour? Perhaps Sinn Fein are the real beneficiaries? Of course social class is only one marker of political affiliation - and possibly a weakening one at that. 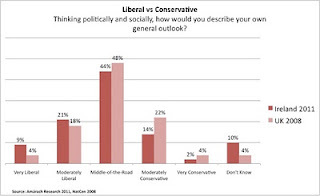 A more straightforward approach is to come straight out and ask people whether they consider themselves - politically and socially - to be liberal or conservative? The question was asked as part of the British Social Attitudes survey - the most recent findings are from 2008. However, 'liberal' and 'conservative' are words that mean different things to different audiences. In the United States the words tend to code directly to 'Democrat' and 'Republican'. Even in the UK the very word 'conservative' connotes the Conservative Party. Canada, Australia and New Zealand also have their own, unique historical associations with the words. Which brings us to Ireland. We have never had political parties that self-described themselves explicitly as 'liberal' or 'conservative'. One more example of our non-existent 'infrastructure of dissent' lamented by Dan O'Brien in today's Irish Times. Nevertheless, we are familiar with the use of the words and their various meanings in the political dialogue of both Britain and the United States thanks to our exposure to much of their media. So what about Ireland? A survey by my company of 1,000 adults earlier this month asked the same question as in the BSA survey. The chart shows that most Irish people are able to answer the question - only 10% opted for 'don't know'. 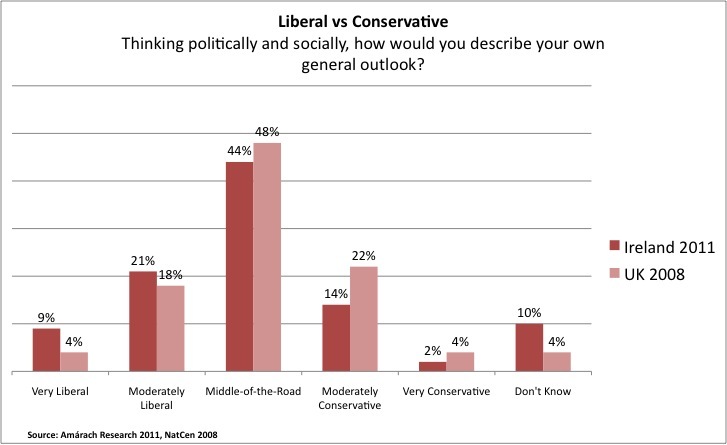 It also shows that we tend to describe ourselves as more liberal than conservative, in contrast to the UK which tended more conservative than liberal in 2008 (and I suspect even more so in 2011). As with the UK, the largest sub-group in terms of political and social values in Ireland are those who describe themselves as 'middle-of-the-road'. Just as most Irish people self-describe themselves as dead centre in terms of the Left-Right political spectrum. Irish men are more 'extreme' politically and socially than Irish women: they are significantly more likely to describe themselves as either liberal or conservative than women - among the latter 48% describe themselves as middle-of-the-road versus 40% of men. Although older people (over 45s) are more likely on average to describe themselves as conservative in Ireland, it does not follow that younger people are more liberal than average. In fact, over a quarter (26%) of 16-24 year olds in our survey answered 'don't know' to the question - substantially more than any other age group. So much for youth being in the vanguard of political radicalism. Dan's 'infrastructure of dissent' looks set for the same fate as our ghost estates: incomplete and unfinished for some time to come. You will have noted that the Sunday Times ran an article on 20th February based on this post. I hope they paid you something for it!